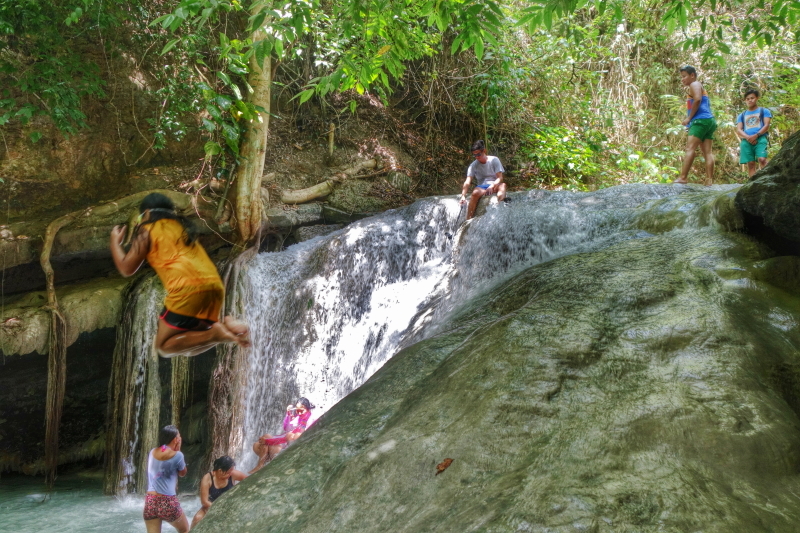 Samboan has several waterfalls and Aguinid is undoubtedly the most popular among them. 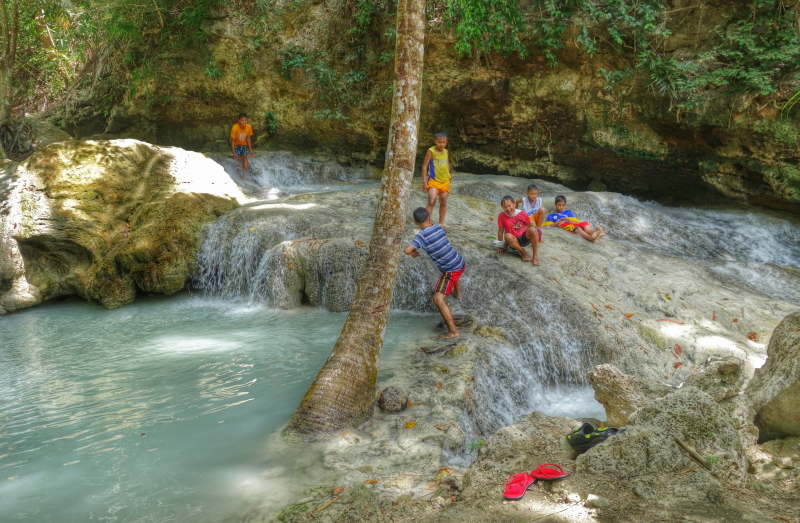 This was our last destination when we decided to do falls hopping in Samboan for a day. 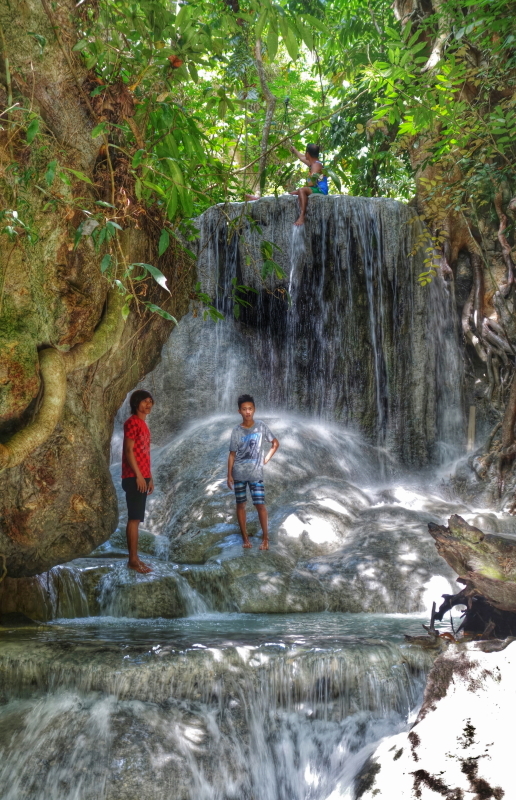 Among Dao, Binalayan, and Aguinid Falls, the 5-tier Aguinid Falls is the most accessible. 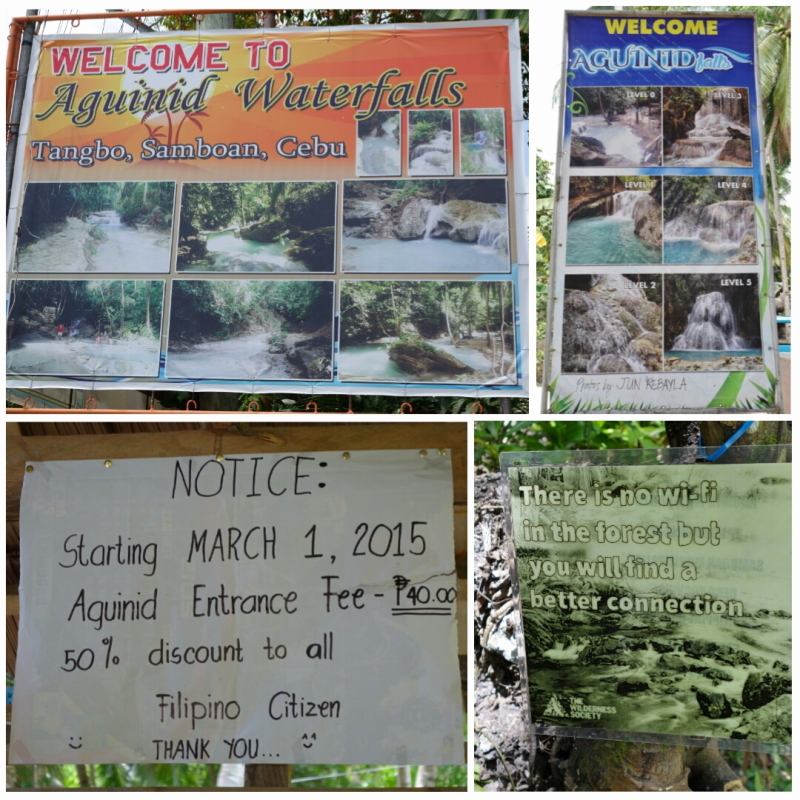 It is a mere 5-minute walk from the main road and unlike the path in the other 2 falls, Aguinid’s is already paved. Don’t let this fool you, though as Aguinid also happens to be the most difficult to conquer among the three. Entrance fee is Php 40, but locals are extended 50% discount. Just look at the quote. It speaks of the purpose of my going to Samboan, which is to reconnect with nature to recharge myself. As mentioned, Aguinid Falls has 5 tiers, though they started the count at 0 so technically, there are 6 tiers. 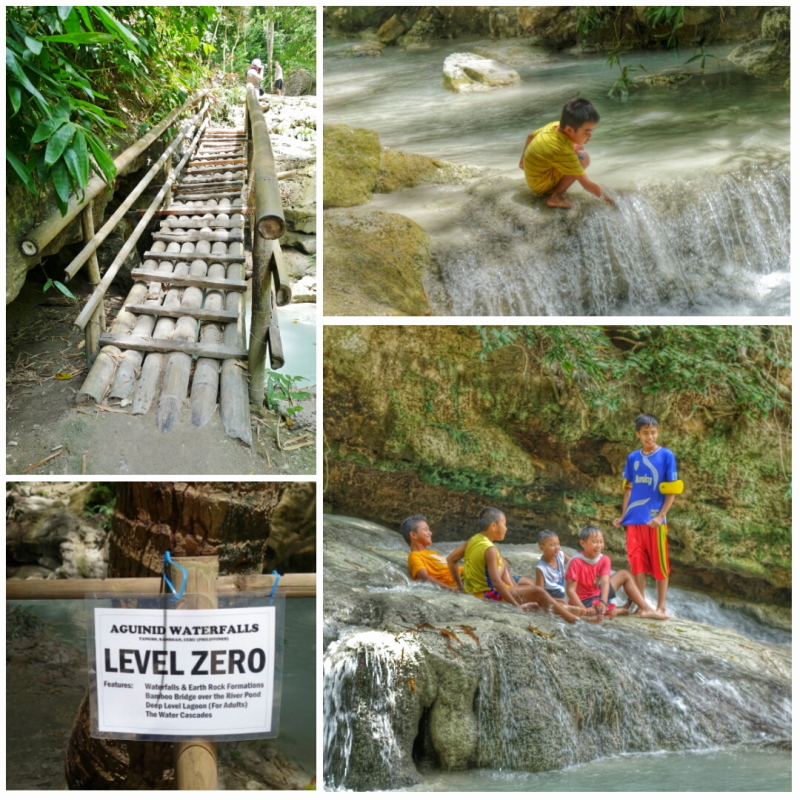 Level 0 features mini-waterfalls, earth rock formations, bamboo bridge, lagoon for adults, and water cascades. It was a holiday when we came here so there were a lot of people. Again, get ready to get wet because to get to the higher levels, you have to wade into the water. 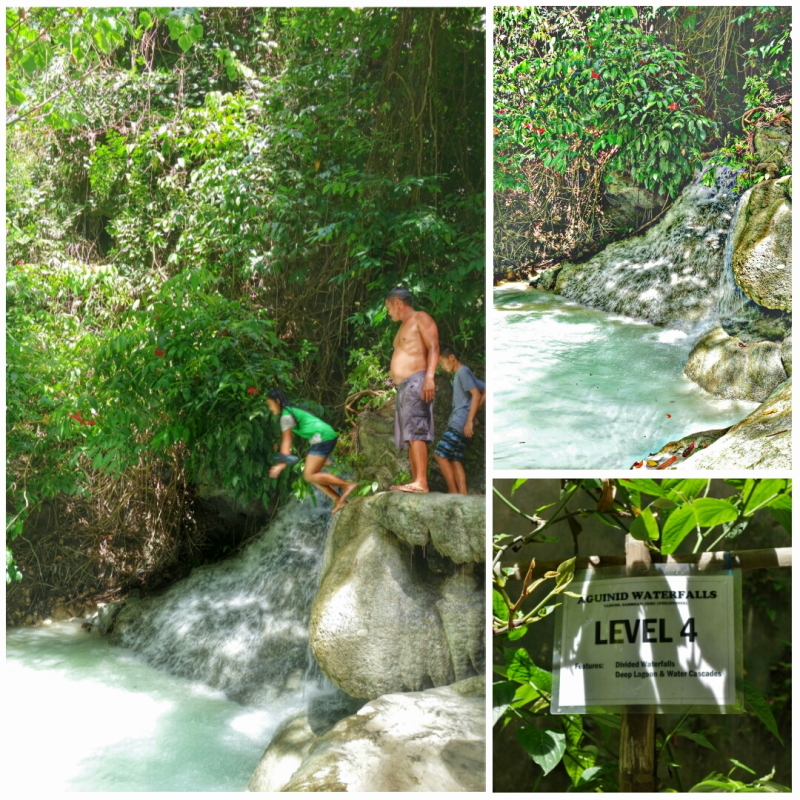 Level 1 has falls higher than what’s on Level 0, rock formations, a selfie deck and shallow river pool for kids. I didn’t get to discover where the selfie deck is located because I was too busy trying to keep myself alive. Seriously, why would anyone take a selfie here when there’s the danger of slipping, or bumping into anyone? Going up, I was amazed at how this courageous kid was having so much fun jumping off the rock formation, while most didn’t event dare proceed to the higher level. At the bend after the above photo was taken, I saw this Climbing Do’s and Don’ts. It wasn’t displayed prominently though, so others just ignored it. 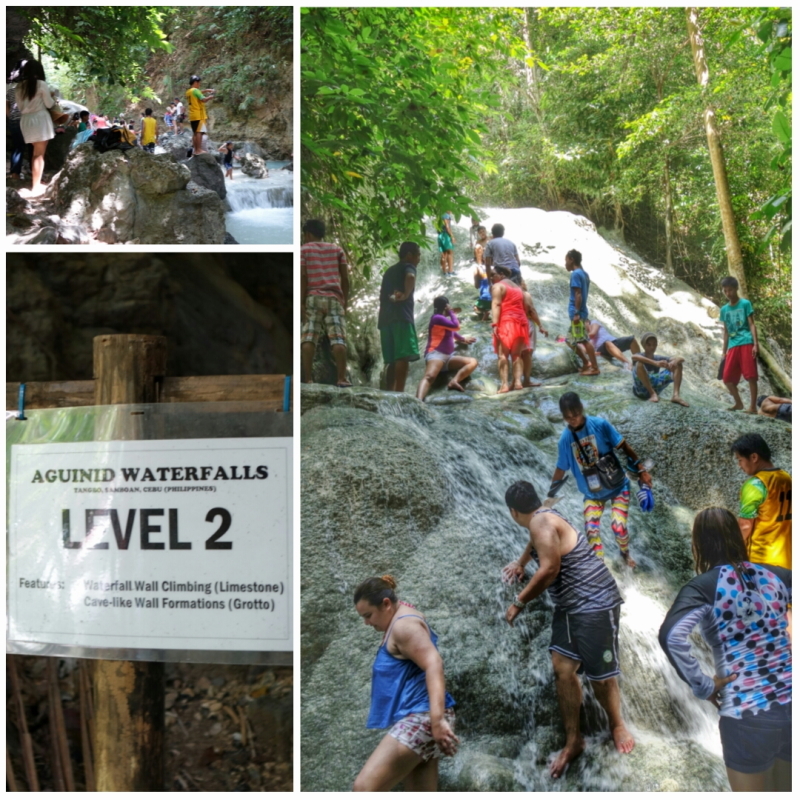 Level 2 features cave-like formations and the waterfall wall climbing challenge, which was the most difficult part of our entire climb of Aguinid since it required climbing a steep limestone wall. 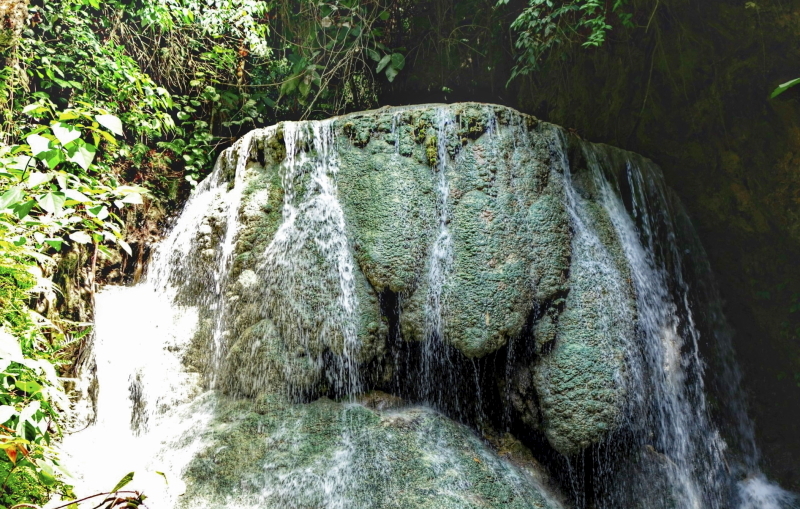 While the locals did create small “wall cavities” through the limestone where we could anchor our hands and feet on, the rushing water made them difficult to find. To ensure everyone’s safety, they limited the number of persons who did the wall climbing and they did it one person at a time. It was actually scarier to wait because I kept on hearing people voicing their fears and it didn’t help that our driver guide backed out. I almost joined him, but Alex, our other guide said the experience would be worth it. Aaand finally, I made it. Too bad I had no photos since I didn’t have a waterproof camera and Alex carried my waterproof bag with my camera and phones in it (the purple one in the succeeding photo, which was taken after we conquered Level 2). Level 3 was beautiful. 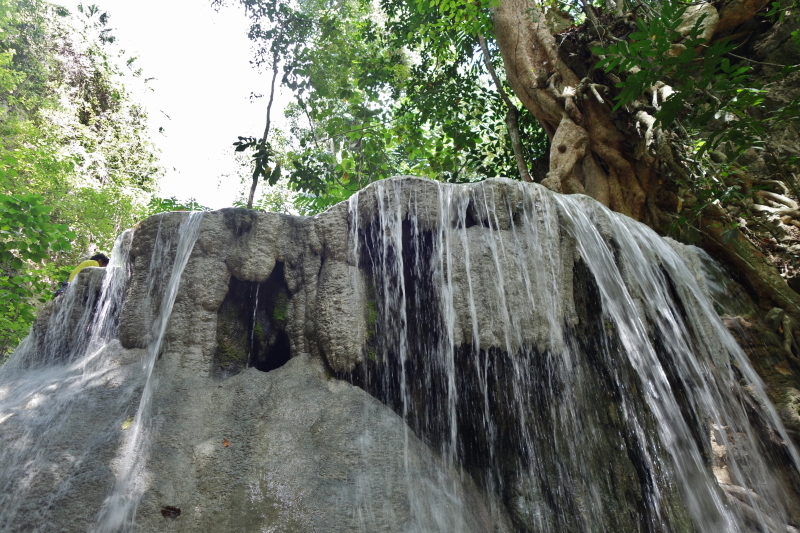 The main photo from this blog was taken at Level 3, which features waterfalls and earth rock formations, a selfie deck (no wonder there was heavy traffic because people kept on taking selfies), and water cascades. 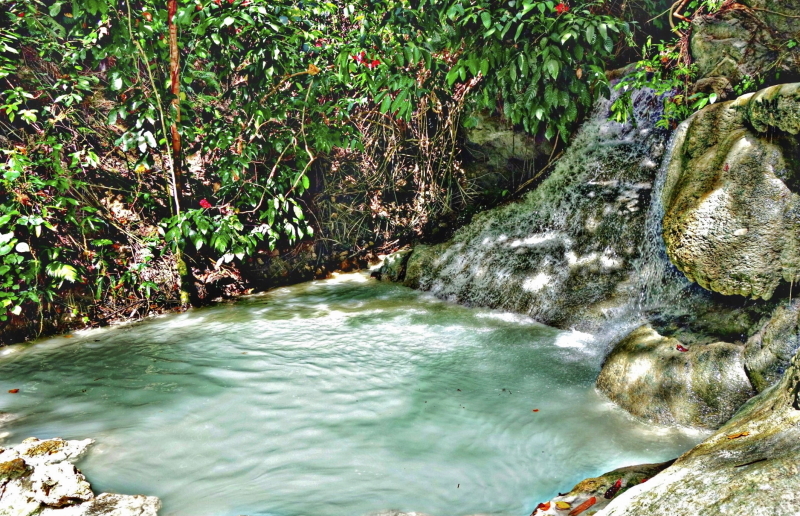 Here’s a photo of Level 3’s water cascades. 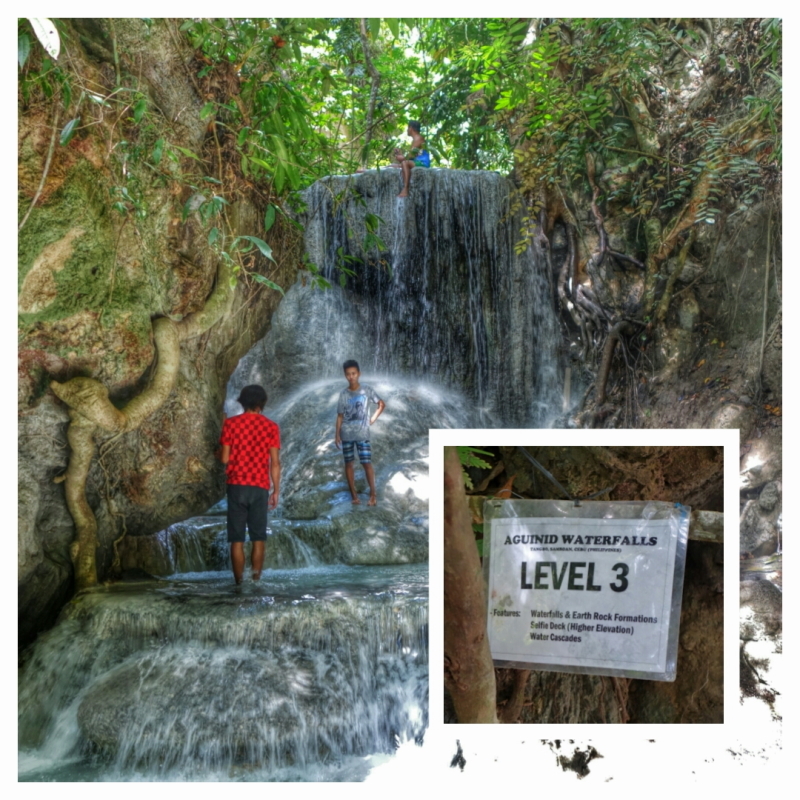 Right after this is Level 4, with its divided waterfalls and deep lagoon. Here’s my favorite photo of the deep lagoon. A few meters from here is Level 5. We thought that when we arrived here, there would be fewer people, but we were mistaken. There were many! While here, I kept on looking for a signage similar to what’s on the previous levels, but there was none. I voiced it out to my friend and a local guide heard me so he explained that it got washed away during a recent typhoon and they were yet to replace it. My friend and I thought that we would have our moment underneath Level 5’s rock formation and water cascades, but there were just too many people coming in so we decided to just head back since we’re so tired anyway. Here’s my parting shot of Level 5’s water cascade. The climb down Level 0 was again a little challenging, especially going down from Level 3 to Level 2. 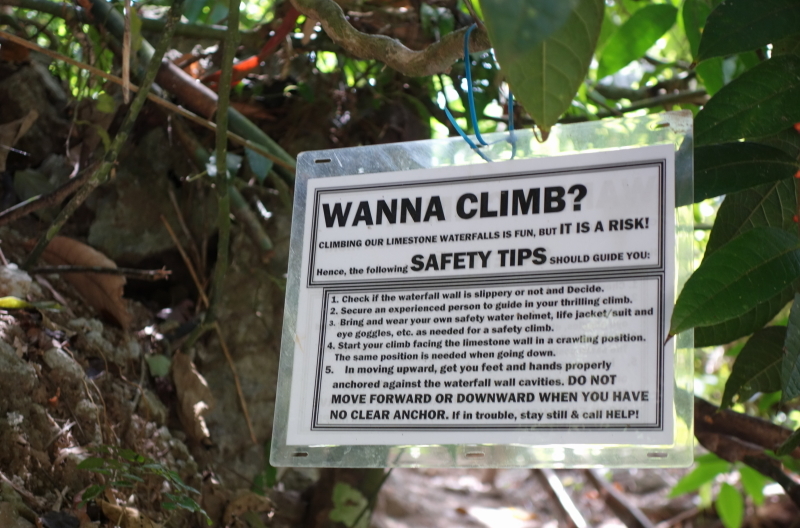 Thankfully, there were local guides who would tell us where to place our feet and/or hands while clambering down, so we made it down safely. 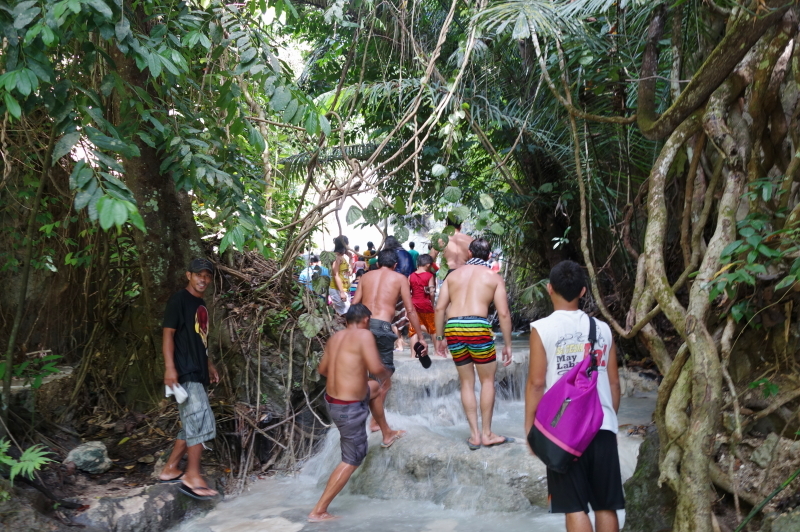 A tip to those who wish to explore Samboan. Do not start your itinerary by going to Aguinid. The climb here was so physically draining that afterwards, we opted to go home and rest. If we came here first, we’re sure we would have skipped Dao and Binalayan. 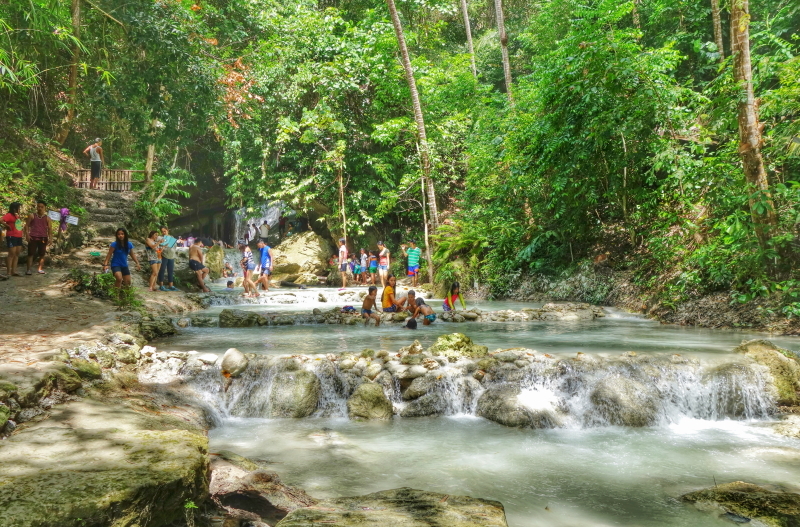 In closing, Aguinid Falls is beautiful, but it’s too crowded for me. 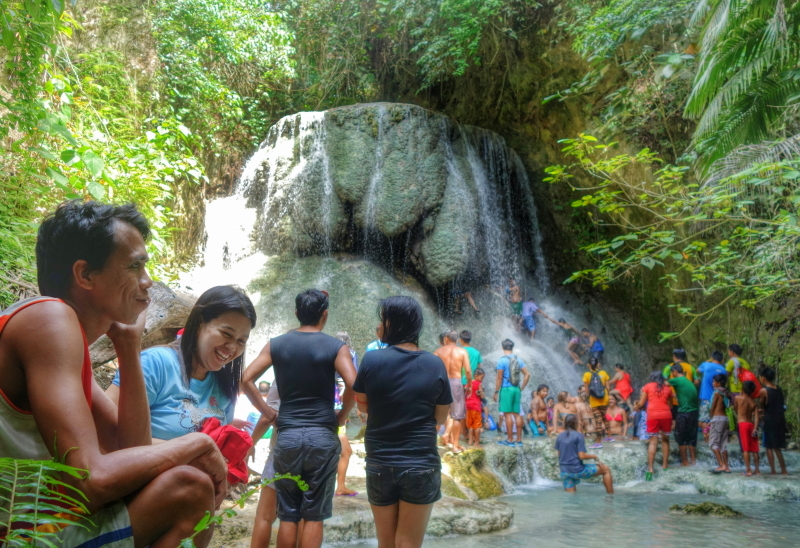 I wish the local government would start implementing a carrying capacity for all its falls so that they don’t get crowded and they can be preserved for future generations. 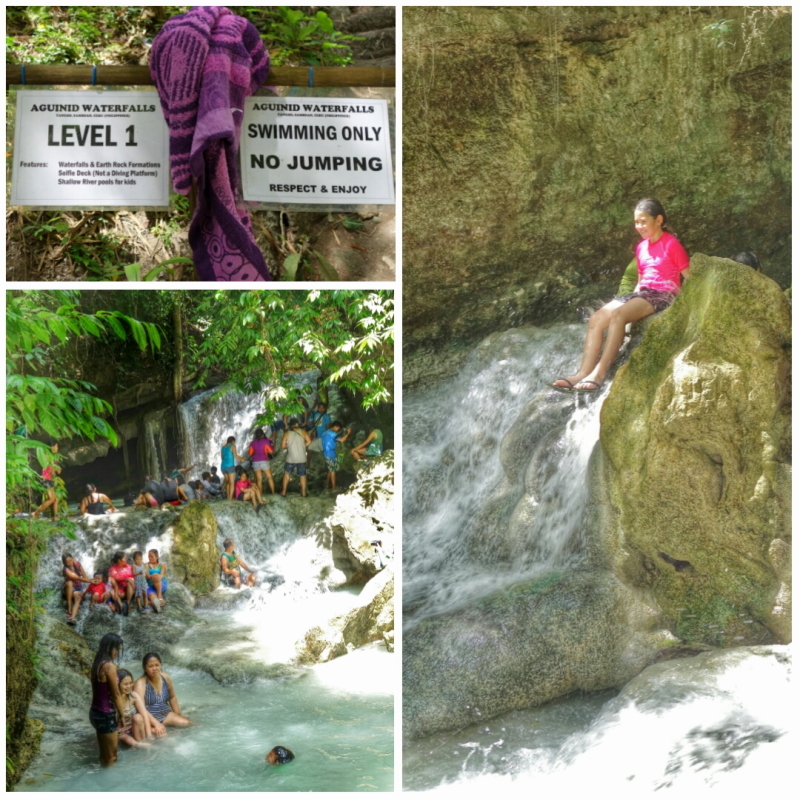 This entry was posted in Travel and tagged Aguinid Falls, Cebu, Falls, Samboan on June 13, 2015 by milai.